A former boss of mine once told me “the green is the heart of the golf course”. It is where every inch of a putt counts; it is where golfers spend more time before every shot; it is where money is made or lost. It is also where a reputation of a golf course, a golf club and a golf course superintendent is made, or lost. Is it any wonder then that of all the money spent on golf course maintenance, most of it will go to the green? There are special machinery used on the green, there are special fertilizers used on the greens and there are special chemicals used only on the green. Some golf courses even have staff that specialized on greens. Greens are built in a different way than the rest of the golf course. Even the sand used on greens is more expensive than the sand on fairways or tees. And of course; the grass on the greens are rarely used on the fairways or tees. 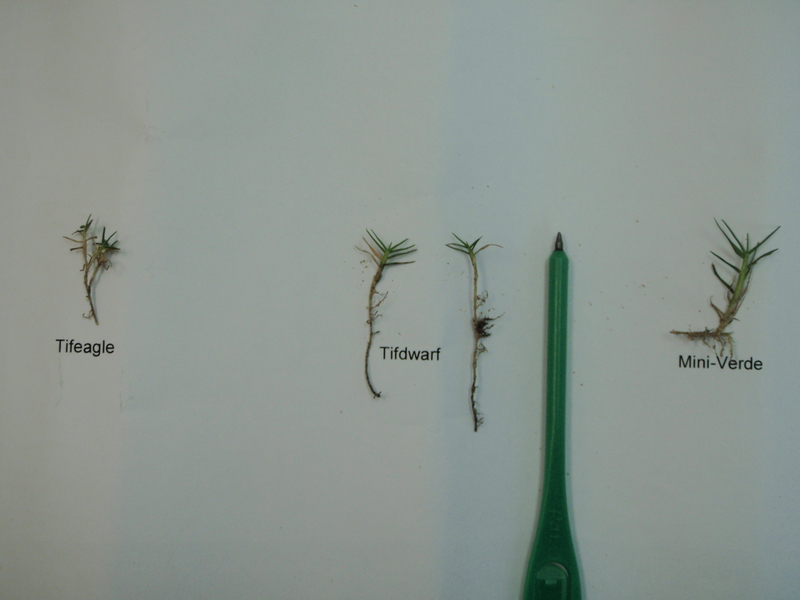 The grass used on most golf courses in Malaysia is from a variety called Tifdwarf. This is a variety that was found in the state of Georgia, America in 1965. There are some older golf courses in Malaysia that uses Serangoongrass as the grass species for their greens. In the 1950s, two species of Bermudagrass were hybridized. The resulting variety of the cross of the two species were cultivated and released as Tifgreen. Legend has it that the Tifgreen cultivar was distributed to a few golf courses in Tifton, Georgia for testing. But the superintendents in these golf courses saw that amid their test plots, there were a few patches of grass that grew shorter than the grasses surrounding them. The superintendents isolated these patches and planted them in a separate nursery, and that is how the cultivar Tifdwarf came about in 1965. So now we know that the grass on most of our greens, Tifdwarf, has been around for about 43 years – probably longer than some of us and in quite a lot of cases has done quite well. So why is there a need to breed and introduce new turfgrass for greens? 15 years ago, green speed for normal play of about 7 feet on the Stimpmeter was considered good enough. So cutting the greens at 5mm, occasionally rolling it and even using fertilizer meant for plantations were sufficient. But no more; with the advent of TV golf, with more golfers being able to travel and play all over the world; in short – with the world becoming a ‘global village’; the pressure and demand from golfers on Malaysian greens are higher. So, when in those days to be recognized as top-quality greens, it is sufficient for a grass to be able to withstand daily cutting to a height of 4.5mm and maintain a smooth, uniform surface; now I’ve known greens that are cut to about 3mm. Yet at the same time; its leaves must be fine, soft, closely spaced AND must also have a uniform dark green color. Remember: one inch is 25mm so if a grass is 3mm, how big do you think the leaves, that make food for the plant, would be? And after all the pounding from golfers, machinery, workers, caddies, consultants and the lot, the grasses are expected to maintain a green color throughout their growing period. Low maintenance costs are a bonus and, though of lesser importance, low establishment costs should also receive major attention. Resistance to drought, cold, disease, insects, nematodes, and weeds will lower maintenance costs. Wear resistance, shade tolerance and low weed potential are other important traits that should be added. On top of that, golf courses wants to have the option of choosing a turfgrass that is suitable for their particular climate, condition or preference. Golf courses that are by the seaside or that have bad quality irrigation water may need to choose turfgrass that will thrive under these conditions. Some grasses may be chosen because they tolerate shade more and there are some that is chosen because of their color. For easier maintenance – and I reserve my judgment here – some golf courses choose to have grass that can be grown ‘tee-to-green’. Another reason is that after 43 years and after so many generational changes, the Tifdwarf on one course is different than on another course. In fact, sometimes the Tifdwarf on one green is different from another green on the same course. Heck, I’m sure you’ve seen different Tifdwarf on one green! I mean, how many golf courses in Malaysia actually imported their Tifdwarf from a certified nursery in Georgia or Florida or Australia or anywhere? They probably got it from a golf course next door who got it from a golf course down south who got it from the boss’ friend’s uncle who got it from his cousin’s golf club’s 7th green which was replanted a year before that from the nursery behind the workshop which was done by the previous superintendent who was rumoured to have got the stolons from a golf course when he went on a fact-finding trip to a neighbouring country. So, will the real Tifdwarf please stand up? Who you calling a mutant? Which one is the original Tifdwarf? How are new grasses discovered? One method is by getting new hybrids. For example; the cultivar Tifgreen is a hybrid from the cross of two species Cynodon dactylon and Cynodon transvaalensis. Two different species (C. dactylon – commonly called the common Bermuda – has 36 chromosomes and C. transvaalensis aka the African Bermudagrass that has 18 chromosomes) were ‘married’ to get a hybrid that has 27 chromosomes. They don’t actually become a new species, it is referred to as a variety, and if it was cultivated then it becomes a ‘cultivated variety’ or cultivar. The second method is the most common; the selection of grasses that has somehow mutated. These mutations – also called ‘off-types’ – can happen spontaneously or it can be induced. You pick a patch of grass that has the qualities that you want, take it to the nursery and give it the tender loving care that will make it multiply. Earlier I have told you about how Tifdwarf is discovered; and you probably would have guessed; Tifdwarf is an ‘off-type’ of Tifgreen. What most people don’t know is that Tifdwarf has a brother. It was found at South Carolina Agricultural Experiment Station, in 1968. It was called Pee Dee 102. No, ultradwarves are not the short version of Ultraman but the name given to the new generation of Tifgreen and Tifdwarf off-types. Examples would be Quality Dwarf, Classic Dwarf, PF-11, FloraDwarf, and Champion. Are they better than their ancestors? Well, they have short internodes which mean they definitely can be mowed at a lower height. The concern is that their environmental range is not well known, yet. Another concern is that if they are meant to be cut at a very low height and due to machinery or staff expertise they can’t be cut at that intended height, what could happen? Tifeagle is a mutant. It was made in a lab by people dressed in white coats, who were protected by radiation barriers, wearing radiation badges and going through doors that have Geiger counters. Have I got your imagination worked up yet? This sterile, fine-textured, medium green variety is a cobalt-induced (gamma-irradiation) mutant of Tifway II made in 1988. It was evaluated in over 25 golf courses in the US from 1993 to 1997 and to all intents and purposes as a putting green, is superior to Tifdwarf. However, it needs a higher cultural practices maintenance program. It tends to get full of thatch faster than Tifdwarf. Of course, so far, it has also been proven to be genetically stable as compared to Tifdwarf and can be identified through DNA fingerprinting. A vegetative selection from what is believed to be a mutant of Tifdwarf; the variety, first produced in 1992, has very fine leaves, a rapid lateral growth rate, improved stand density and uniform green color. Seashore paspalum is a salt-tolerant grass that has been recorded on golf courses since the mid-1970s. It was only used on a limited basis because of its inferior turf quality but this last decade has seen major advances in its development with the introduction of several fine-textured varieties. It can withstand a wide variety of mowing heights so the same grass can be used on tees, fairways, greens and roughs. This is actually an important consideration for anyone thinking about using this grass, as maintaining playing surfaces of mixed grasses, e.g. paspalum fairways and Bermudagrass greens, is not recommended as cross-contamination is highly likely. Paspalum produces a very dense cover and tight canopy on tees, fairways and rough, providing excellent lies. It possesses a deep root system that can extract water from lower soil depths, even at low mowing heights. 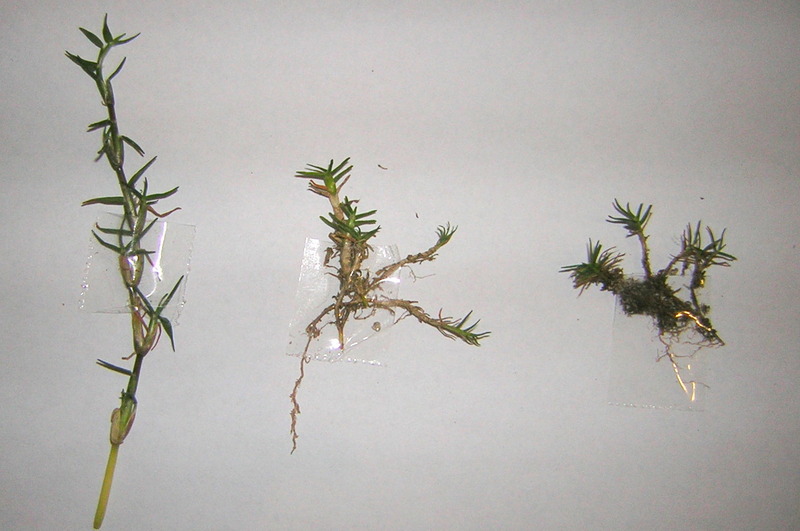 Seashore paspalum has very good drought tolerance if it has a good root system. Unlike Bermudagrass, seashore paspalum maintains good turf quality in shaded areas or during cloudy weather. However, all this comes at a price. The experience of Malaysian Superintendents (and at least one Indonesian I’ve spoken to) shows that the cost of pest and disease control on this turf species is substantially higher than on Zoysia or Bermudagrass. For some reason, insects and pathogens seem to love this grass. Now for the ‘Malaysia Boleh’ story. Satiri is a new vigorous superdwarf (no it’s not a small Superman, just another way of saying ‘ultradwarf’) that is more shade and water stress tolerant compared to many other locally planted grass varieties, including Tifdwarf. This variety was developed from a grass breeding program at our own local Universiti Putra Malaysia. The program started in 1998 with the identification and collection of 117 off-type mutant varieties within the greens in Malaysian golf courses. The varieties were subjected to molecular DNA analysis in 1999. After intense morphological (1999-2000), shade (2001-2002) and water stress (2002-2003) tolerance evaluations one variety was selected. It was planted as a test on the UPM Golf Course in 2004 and launched in 2008. It was named Satiri. With the ability to be cut at the height of 3mm, this could be the choice of Malaysian golf courses that prefer to ‘be original, buy original’. So, what is the better grass for greens? That would depend on many factors and not just about how the green putts. We don’t choose a grass just based on how low it can be cut and how fast the green will be. We need to ask ourselves; can the golf course afford the maintenance cost of the grass that was chosen? Will the water quality affect the health of the grass? Can we take the risk that the grass will mutate in the future? Will the trees around the greens pose a shade problem in time to come? Will the heavy golf traffic on this golf course be a problem if the grass needs to be constantly treated for pest and control? Do we want to buy the real thing or do we just want to get some grass from the No. 1 golf course in the country and risk contamination? Or shall we breed our own off-type mutant? The better question would be; what is the better grass for the greens on this golf course? This is an article written for a local Malaysian golf magazine. I wrote it many years ago and decided to post it here for other golfers/whatever to read. I am not endorsing anything or anyone and it is not meant as a technical reference.